Are you a fan of the Sony Playstation 3? Are you filthy rich with an over abundance of disposable income? Are you looking for the ultimate Holiday gift? Or maybe just a little something for yourself? Say no more. Here’s a gaming console made just for you. Introducing Sony’s 24-Karat gold-plated Playstation 3, which comes complete with two matching controllers and a one-year warranty. Starting at $4,999 USD. You will also have an option of either of a plated or anodized PS3 logo, which really sweetens the deal if you ask me! A jeweled limited edition model with a lifetime warranty is also said to be available in the coming weeks for those who may be more into diamonds and rubies than gold. they should make a kool design insteed of making it gold plated. lol and i wonder if it overheats easy because of the gold. i want just the controller. i wonder how much that would go for. lol well i have to think about that cus i already gave that to WoW. lol. do u see my avitar(not the movie sOs-Vlan) thats all i do. HAHAHAHAHAHAHAHA it isnt bad its good for u. 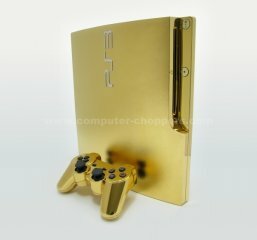 Subject: Re: Bling PS3 24K Gold Plated!